Although Ira was a competent landscape painter, he wanted to be different. As he told me, “Either you are original, or why bother?” A visit to Australia and aboriginal art was an epiphany for him. He formed his unique style combining Native American symbolic images, Mexican primitive, pop art, and aboriginal pointillism. When I saw one of his paintings during First Friday Art Walk, at another gallery in Fredericksburg, and met Ira Kennedy for the first time, I didn’t know what to think of it, I just knew him for the Enchanted Rock Magazine and as author of a history of Enchanted Rock. 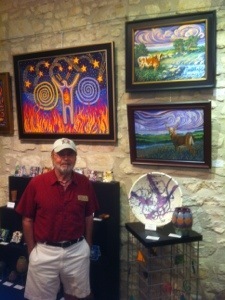 As I have gotten to know him and his story, I have come to see his art as an extraordinary blend of spiritual mystery and natural beauty, as utterly unique in a sea of excellent Hill Country art. A viewer cannot be ambivalent about Ira’s paintings; they demand attention, they tug at your soul, they will not leave you alone.